We’ve been using emails forever, but how many of us are aware of all the email jargons used in the web space? Whether you use Gmail, Outlook, or any email client, there’s more to how you send and receive email that it looks on the surface. In computing, standard protocols are used by email clients to access and retrieve emails from a mail server over a TCP/IP connection. Two of the most common and widely used internet standard protocols for email are IMAP and POP3. Both IMAP and POP3 are application layer standard Internet protocols or methods used to access email messages from a remote server. Both are methods used by your computer to establish a host-to-host connection between email clients and mail server. However, this is where most of the similarities end. IMAP is short for Internet Message Access Protocol. It was created in 1986 by Mark Crispin as an alternative to the original Post Office Protocol with the idea of keeping users from being tied to a single email client. It is the standard email protocol that allows email programs to access email accounts on multiple devices. It keeps the messages stored on a mail server while allowing users to manipulate the messages as they were stored on the user’s local machine or device at the same time. It allows users to access, organize, and sort their email messages without having to download them first because the server keeps the record of all the messages sent thereby allowing you to access your email client from literally anywhere you want. POP3 stands for Post Office Protocol Version 3. It is the third iteration of the original POP. Unlike IMAP, the POP workflow is quite simple; it receives and holds email for as long as the individual with the email client picks it up. Unlike IMAP, it does not make copies of the mails it receives and stores them on the server. So any changes you make on one device won’t be replicated on other devices. It is a more sophisticated internet access protocol which allows users to store emails on the server for a limited period of time allowing them to access and download those mails as many times they wish within that given time frame. All things considered, POP3 is a fast, robust method that is particularly useful if you access your email from one device. IMAP, short for Internet Message Access Protocol, is an application layer internet standard protocol used by email clients such as Gmail, Outlook, Yahoo, and more to retrieve email messages from a mail server. It is a method used to send and receive email messages through a remote server without a particular device support. POP3 is a simple, standardized method used by email clients to retrieve email messages from a server in an Internet Protocol (IP) network. POP3 is short for Post Office Protocol 3, which is the third iteration of the widespread protocol used for receiving email. The first IMAP was designed by Mark Crispin at Stanford University in 1986 as a potential alternative to the POP, which is the original protocol created in 1984 as a simple means to access emails on a remote server so it could use locally. A second version was published in 1985, POP2 which expanded the capabilities of POP by implementing a whole new bunch of commands and replies. A more refined and enhanced version of the POP was introduced in 1988 as the Post Office Protocol Version 3 (POP3). IMAP was introduced in 1986 as a simple mail access protocol to allow remote access to email messages stored on a remote server. The IMAP workflow is a bit more complex than that of the POP3. In IMAP, a connection is first made to the email server, and then the content requested by the user is obtained and cached locally. A copy of all the email messages is then transferred to your local machine or device and the changes done by the user are then processed and the actions are mirrored on the email server. In POP3, the email client first connects to the email server and retrieves the email information and store the data locally as a new one. A copy of all email messages are then transferred to your computer or device and then the messages are deleted from the server. IMAP is a simple internet access protocol used for accessing emails on a remote server. It is more flexible and is ideal for users who access their emails from multiple devices or computers. As all messages are stored in folders on the email server, your configuration is synchronized across all devices meaning multiple programs can access the same account from multiple devices, all synchronized. 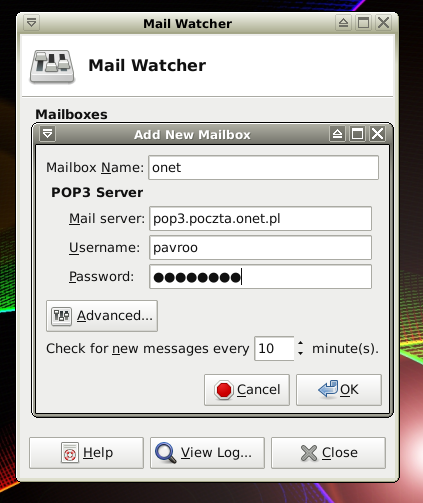 POP3 is ideal for users with only one email client and who do not need access to messages remotely or for users with limited storage assigned to their account. Any changes made on one device won’t be replicated on other devices. POP3 is supposed to be dead a long time ago, but is still in use because many people don’t know how to switch to IMAP. POP is the original email access protocol introduced n 1984 as a simple means for accessing email messages on a remote server. IMAP was developed in 1986 as an alternative to POP which extended the functionality of the POP to being a two-way access protocol. While IMAP is ideal for users who access their emails on multiple devices or computers while keeping them all synchronized, POP3 is ideal for users who access their emails on a single device or computer which makes it very slow to download emails if large numbers of email messages are stored on the remote server. Business users, however, prefer to use IMAP as it allows for added security such as email encryption. Sagar Khillar. 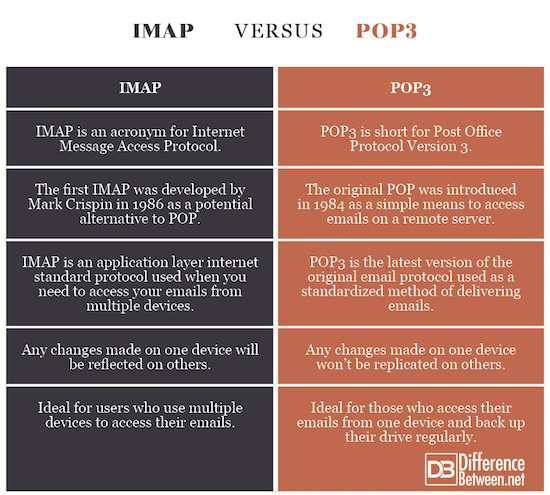 "Difference Between IMAP and POP3." DifferenceBetween.net. May 29, 2018 < http://www.differencebetween.net/technology/internet/difference-between-imap-and-pop3/ >.